I was more than honoured to be named 1 of Edmonton's Best Dressed Women for 2016 by NARCITY. It was a bug surprise as I didn't even know that this article was going to be written let alone, feature me in it! First off, let me say, that it's not easy posting fashion pictures ALL the time. It's a lot of work - coming up with different outfits all the time is tough. And not only that, Instagram is my #1 social media source and there is a lot of "competition" on there. You're "competing" with people who have the funds to buy all the popular trends and I've got too many other priorities to worry about having that new purse or those new shoes and it's those things that a lot people notice and make them double tap on their photos. But not only that, I'm not a fashion follower - I do follow some fashion trends, but I stay true to myself. I don't start wearing boyfriend jeans because they're in style or constantly wearing runners because it's in. That's not my style and it doesn't suit me, so, no I won't cave and wear them ALL the time to fit in. Blogging is a lot of work - even more so now than ever. In the last couple months,I've been pushing myself to put out better content and pictures for my blog. Before I used to slap some words and photos together and hope for the best. I would take photos in the backyard or up against a white while and just pick the best photos and if they didn't turn out, keep trying and trying. And my content was weak. There was not heart or soul in my posts - just "oh hey, went to the mall today", like a 12 year old writing in her diary. But now (and a big thank you to Israel) I've been able to capture beautiful photos - Israel and I invested in a new lens, started finding locations to take beautiful photos and have done A LOT of experimenting with night photo shoots! I've taken a lot more time to think about what I'm going to talk about in a post (minus my spellcheck - I never do that. I should just write my posts in Word.....) and have tried REALLY hard these last couple months. Hard work will only get me further if I want to make something out of blogging. I wish I could put more dedication into it but I put all I can. I have school, work and a wedding coming up so I have more than I can take on right now and now that I've been dedicated to blogging, it's probably a little more than I should be taking on! But that isn't going to stop me. I love doing what I'm doing now and I love that even the smallest recognition pushes me to be better. Now I just have to keep it up and keep pushing myself. I had the opportunity before when People Style Magazine featured one of my outfits but instead of using it to my benefit, I stopped blogging. I don't know why, probably because it was such a pain to take my own photos and thinking of posts to write were tiresome. I work hard for my blog and I stay true to myself. That's all that matters, it just means I have to work extra hard to gain a follower or get more likes but that's fine. I'm proud to have been called 1 of Edmonton's Best Dressed Women for 2016 by NARCITY and to have done it by being true to myself and putting in that work. Fantastick outfit! I love this jacket! Congrats on the award, indeed hard works pays. 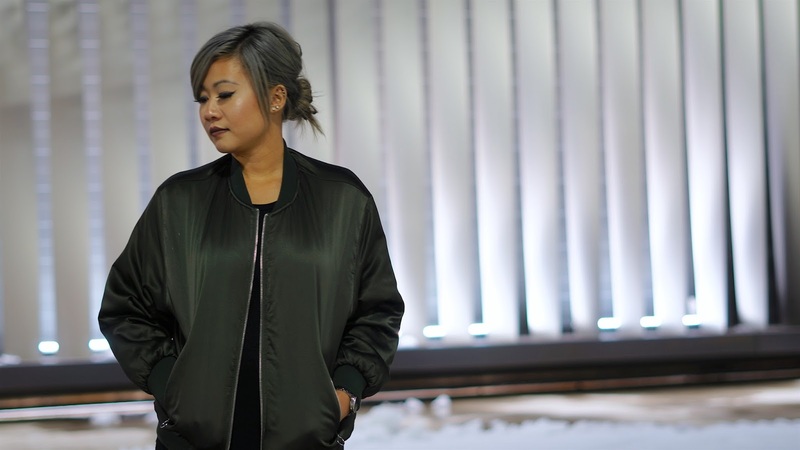 Congratulations for being one of Edmonton's Best Dressed Women for 2016 by NARCITY! I can totally understand and relate on some level with the struggles/behind the scenes of blogging. I really appreciate your honesty, I found it very insightful and refreshing to know there's someone out there who can relate. I love your pictures - you look amazing! I really like your style!! !I also enjoyed reading your post! Blogging definitely means a lot of work!